Did you get your Girl Scout cookies yet? I ordered from two different people so it looked like I only ordered three boxes when in reality it was six boxes. 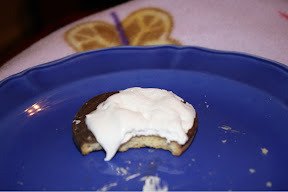 I tried a new variety this year - Thanks-A-Lots - to go with my tried and trues - Samoas (or caramel delites as they call them now), Tagalongs and the lemon ones. The family I purchased the Thanks-A-Lots from filled me in on their favorite way to enjoy the cookie. Grab a couple of cookies and a large marshmallow. 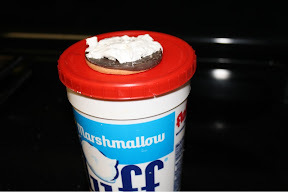 Set the marshmallow on top of one cookies and pop it in the microwave. Ta-da...you have a S'more like gooey treat! 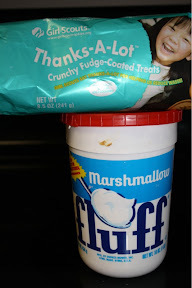 Now, this intrigued me and while I ate the first two-thirds of the package as is this weekend, I decided to throw caution to the wind and fix me up some gooey goodness. Unfortunately for me, I had no marshmallows in the house. And popped it into the microwave for 10 seconds...until it started to expand. I highly recommend trying this. Right now. What are you waiting for?!? I tried it as a sandwich cookie with two cookies but I think the single cookie option is the way to go. We Will, We Will ROCK You!! This weekend I saw something that I have to admit both intrigued me and scared me a bit. 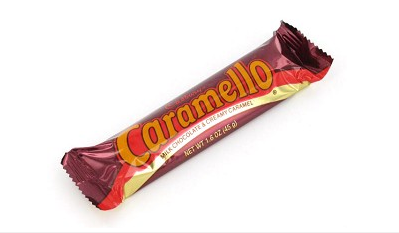 SQUIRREL...OK, every time I hear Carmelo Anthony's name I get a craving for a milk chocolate and caramel candy bar. Anyone else? Sorry, back to the original topic. "ESPN examines the world of full contact jousting"
Take a minute or two and watch the video above. It's fascinating! I guess if there are men and women who ride bulls, wrestle alligators and cage fight, then why not full contact jousting. After watching the segment on what looks to be an up and coming sport, I started thinking about one of my favorite movies - A Knight's Tale. Remember this movie starring the late Heath Ledger and featuring a terrific soundtrack, including "We Will Rock You" playing during a medieval tournament! Notice what Ledger said in an interview with ESPN..."He can joust! He can knock people off horses!" I think this sport has potential. I can just see me heading to my local fairgrounds this summer for a night of full contact jousting in between the demolition derby and mud volleyball tournament! Over the weekend, I caught up on some blog reading and tried to find some inspiration for future posts on this blog. There is so much wonderful content out here and I could (and sometimes do) spend hours reading what everyone has been doing. Little Miss Can't Be Wrong over at how i met your father (still one of my fav blog names) tagged all of her readers (and I'm one) in her recent post about the 5(ish) Things You Can't Leave Home Without. 1. 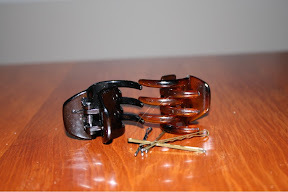 Hair clips and Bobby pins. I'm trying to grow my hair out and when it's not cooperating it's great to have the option to throw my hair up in a twist. For full disclosure, I may have worn my hair up 6 out of the last 7 days...it's just too much to have to mess with it at 5:30 am some mornings! 2. Sunglasses. 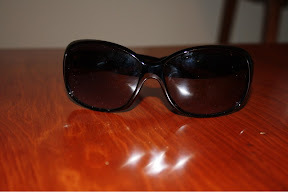 I use these not only as protection from the sun but also as a hair accessory on those days that I wear my hair down! I usually have one pair in the car and one pair in my purse at all times. The ones above are new...Ann Taylor Loft outlet was having an awesome sale this week so I picked up a spare pair. 3. My Starbucks Gold Card. I've tried to cut down on my daily stops at Starbucks but it never sticks. And if I'm going daily I may as well earn free drinks and coupons for free treats. 4. My Blackberry. I am way too attached to my smartphone but I'm trying to leave it in the purse during meetings and family gatherings...actually left it in the car during my niece's Baptism party today. We'll see if it continues. 5. 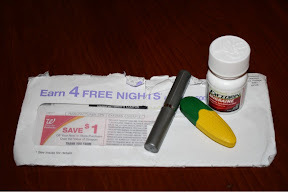 Envelope of coupons, lip balm, Excederin and flash drive(s). I'm addicted to the deals at Walgreens and CVS so the envelope is the best way I have come up with to keep my shopping list organized. It's not fancy but it works for me! As for the other items...I usually have 2-3 flash drives in my purse at any given time. The same can be said for lip balm. The last time I cleaned out my purse, I found 4 tubes! And the Excederin...unfortunately this is a must-have because I suffer from headaches way too often. What are your "can't leave home without" items? So why was I so excited about finding squirrel baskets at Jungle Jim's last week? Have you seen the movie UP? The one with the old guy, the scout and the pack of dogs? My master made me this collar. Soon after I watched UP, I was in a meeting with my boss and a coworker. I'm not sure now what we were talking about but my boss was getting frustrated with me. This drives my boss CRAZY! On this particular day, she finally cut me off and told me to slow down and finish a thought before moving onto the next one. When she said this, I immediately thought of Dug and squirrels! I explained the reference to her and since then when I start to go off in a hundred different directions, she just looks at me and says "Squirrel" or "Stop chasing squirrels." So when I saw these baskets I knew I had to get one for my office and one for her office! I gave it to her yesterday and she looked puzzled for a minute and then started laughing. I'm not sure I should remind her of what definitely is not a good trait on my part, but oh well. I don't think I'll ever stop chasing squirrels but I have become more aware of myself and try to slow down, think and then speak! Speaking of chasing squirrels, when I was looking for images from UP, I came across this image. I'm loving my new squirrel baskets below. As soon as I saw these, I knew that I must have them...the story tomorrow. 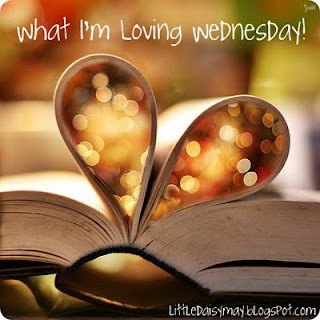 Linking to What I'm Loving Wednesday at this kind of love. a group of my blogging and IRL pals decided we needed matching T-shirts to show how much we heart the Pioneer Woman and her book, her cookbook, her recipes, her photography, her confessions, her writing style...well, you get my point. and Liz from Two Maids a Milking, Leah from Beyer Beware, and I decided we needed a "craft night" so we tackled the T-shirts. Well, Liz decided we needed a craft night and Leah and I went along for the ride! Remember my previous post...the one where I listed all the type of bloggers I'm NOT? Remember that "Crafty Blogger" was on that list? There was a good reason for that. Here's my first attempt to print out the iron-decal. Notice anything? Yep, I printed it on the wrong side. Once I corrected that mistake, I turned Liz's kitchen into a print shop and made nine decals (minus the first one). And I cut them out according to the package directions. I'm a total stickler for following the directions when it comes to doing things that I have NO idea how to do! It was a delicious meal that included scrumptious roasted red potatoes, creamed spinach (from scratch), glazed carrots (brown sugar + honey = yummy) and lamb chops! Look for the lamb chop recipe on Liz's blog soon. Unfortunately, Leah had to bow out of the evening because she is a wonderful volunteer in her community and other duties called. She missed out on lots of fun but we totally understood! Back to the craft project...we lined up the decal on the shirt. Then I pressed the iron down for 15-20 seconds per section. Well, for the first shirt I ran the iron over the decal and didn't count...then we tried to peel the backing off...then we put the iron back on it...then we tried to peel the backing off...and then we put the iron back on...I think you get the picuture. We eventually got the backing off but it was hard work. So, for the second shirt I held the iron firmly down on one section at a time. I even counted out loud to 20...told you that I'm a stickler for following directions! It helped but we still had lots of issues with the edges not sticking, so we got creative with the tools we were using to help fuse the decal to the shirt...our fingers were getting singed so we had to get creative. Yes, that's Liz using a kitchen spoon...it was the tool that we found worked the best. See the plate stand in the background below...used that too! Once we had the decal firmly on the shirt, we started to peel the backing away from the shirt. It wasn't a pretty process but we got it done. The first couple of shirts were rough and the background turned out a bit dark but we pretended it was supposed to look like that and forged ahead. I think we peaked at about shirt number 4. It came out ALMOST perfect. Then it happened...we got a bit big for our britches and started to improvise. The decal on shirt number 5 wasn't sticking as good as it should so Liz decided to just set the iron back on it for just a second. This was NOT on the instruction sheet...and now we know why. Notice anything? Maybe that "heart" is missing. Wonder where it went? I'll tell you where it went...it melted onto the iron! So, now we were down to 8 shirts! Oops...we got our act back together and finished strong. The iron might have gotten a bit too hot...notice the new embellishments below. You say they are marks made by the iron...I say they are just part of the design! We finished with 8 shirts ready to be worn the next morning when we headed to Cincinnati to meet the Pioneer Woman...Liz and I were pretty proud of ourselves! The next morning I pulled my nifty custom T-shirt over my head and heard an awful sound...a sound that didn't bode well for the future of my custom T-shirt. Yes, all of our hard work ruined with one stretching of the shirt! I didn't want to walk into the bookstore and have people not be able to read about my love of The Pioneer Woman...just not acceptable. You see, I bought the cute stretchy T-shirts from Old Navy with the thought that they would look much nicer than the 2 for $5 ones at the craft store. I didn't think about the compatibility between a stretchy T-shirt and an iron-on decal. The two do NOT mix! So instead of meeting the Pioneer Woman in cute matching T-shirts, we improvised. We picked out the best looking T-shirt of the bunch and presented it to Ree when it was our turn to meet her and have our books signed. See it there on the table in front of her? I told her that she may just want to look at it...not try to wear it! Thank goodness she isn't a Crafty Blogger either! On Friday I not only spent the day with a wonderful group of women who make me laugh (and laugh at me), but I also met a woman who's entertained me, inspired me and made me into a bit of a stalker... The Pioneer Woman. More details on that adventure later. 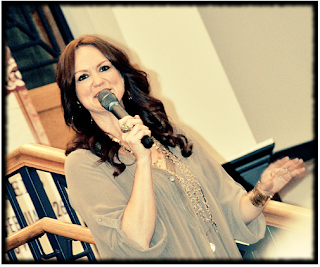 Ree, aka The Pioneer Woman, was in Cincinnati promoting her new book and as part of the book signing event, she answered a few questions from the 400-plus women (a few men and babies too) gathered to meet her. One stalker fan asked for advice on how to decide what to write about on her blog. Ree simply said (and I'm paraphrasing) write about things you know...things you enjoy. This struck a chord with me. You see, I've been struggling of late on how I fit into this vast space I often refer to (as do many others) as the Blogosphere. I haven't been able to define what type of blogger I am. I am NOT a Mommy Blogger...I don't have children so I can't talk about the joys and struggles of raising children. I think it would be frowned upon if I went out and got me a baby just so I could bond with the vast numbers of Mommy Bloggers out there. Though I've talked for years that I would be interested in a time-share child. Anyone interested? All joking aside, I do have 4 kooky nephews and 2 adorable baby nieces so I do have my share of cute kids on my blog. I am NOT a Crafty Blogger...I've tried. I've really, really tried to be crafty. I started to learn to knit but messed up on my first scarf and never went back to it. I scrapbook but am about 2 years behind. More on how these turned out in a future blog post...let's just say I won't be starting my own Etsy store anytime soon! I am NOT a Foodie Blogger...I do love to bake and don't mind cooking but when your signature muffin looks 10 times better on someone else's blog...you are NOT a Foodie Blogger. Cris, I'm not bitter that you are a better baker...really I'm not! I am NOT an Organizational Blogger...hence being stuck on Day 2 of the 21 Days of Organizing Challenge that I started weeks ago. And finally I am NOT an Advocacy Blogger...while I'm passionate about some issues, I just don't feel I have the expertise/knowledge (or probably more realistically the personality) to try and be an outspoken advocate for anything. That being said, I do realize that since I consider myself a farm girl and I associate with many farmwives (who are NOT advocacy bloggers either), I do have a responsibility to answer questions regarding how we raise food to the best of my knowledge when I'm asked (and I have been)...more on this in a future blog post as well. So, now that I've determined what kind of blogger I am NOT, what's next? Sorry, feeling a bit sorry for myself for a minute. I think I'll stick with what I've been doing for almost a year...writing about what I enjoy...what I know...writing about my life. Because, honestly, some of my favorite blogs don't fall into any of the categories above (and some are a mix of all of the above). They are about LIFE and the randomness that makes life funny, sad, frustrating and worth living! I can only hope that something in my rambling connects with someone else out there. And if it doesn't...oh well, as long as I enjoy writing on here, then it'll be worth it. 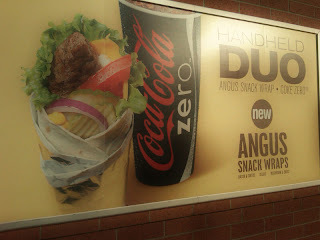 I'm loving that Coke Zero is offered at McDonald's in the Region. And I'm loving that my taking a photo of this sign outside the restaurant made some guy roll down his window and flirt with three cute gals in a mini-van...I think we made his day. 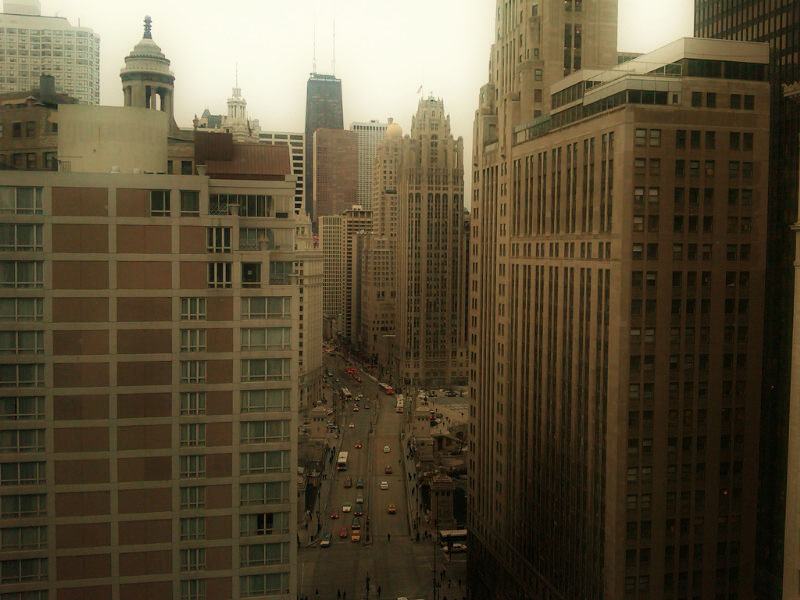 I'm loving that I have a job that lets me have all kinds of new experiences, including hearing some fascinating research from some incredibly smart people while sitting in a room on the 80th floor (that's the top folks) of a high rise in the Windy City. 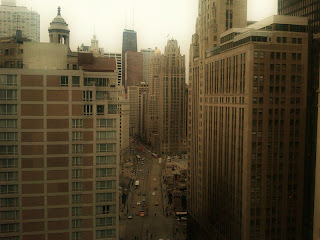 I'm loving the view from my hotel room of Michigan Avenue. 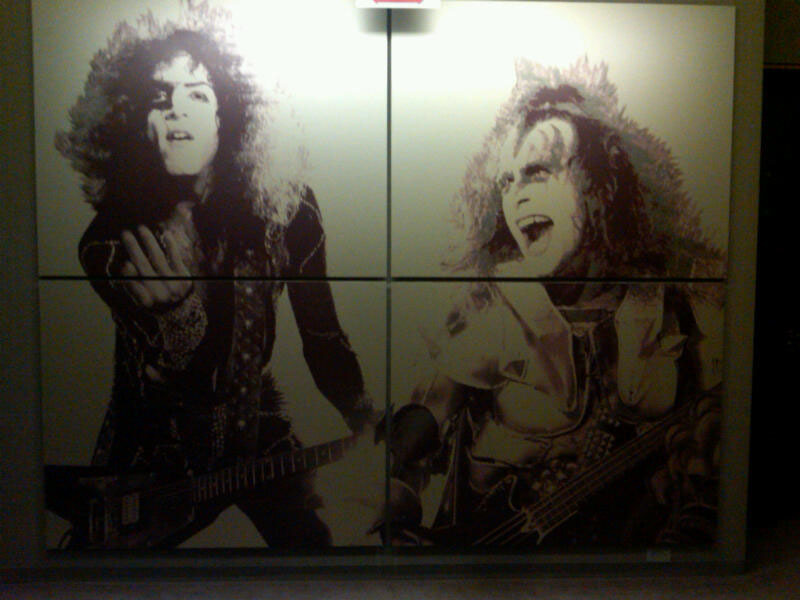 I'm loving that I stayed on the KISS floor of the Hard Rock Hotel Chicago and this is what greeted me as I stepped off the elevator. I'm loving that the hallway decor didn't continue into my room. Instead these Fab Four were waiting for me in my bathroom. I'm loving the street art around Chicago. I didn't take my camera so all of these photos are from my Blackberry...sorry. 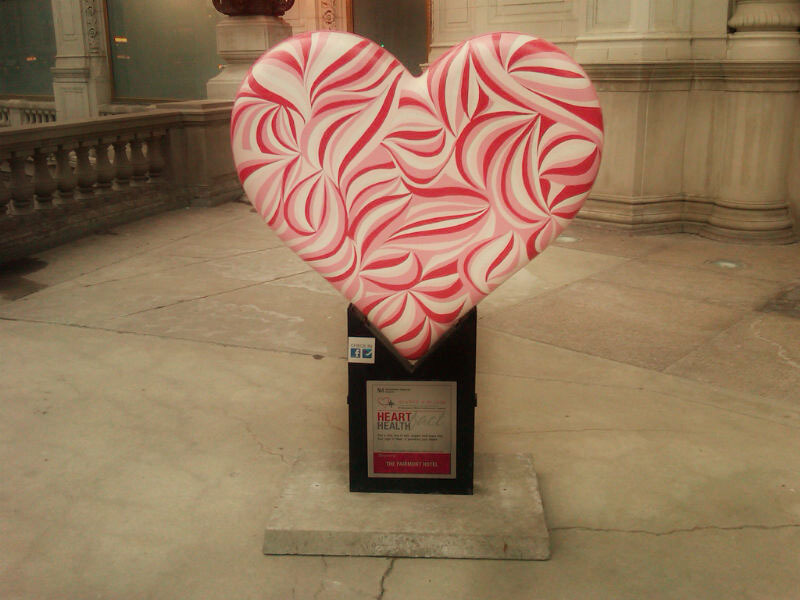 There were hearts up and down Michigan Avenue and they were all different. The one below is the first one I saw so I snapped a quick shot. The goal of the project was heart disease awareness, I think. At least that's what I walked away with! 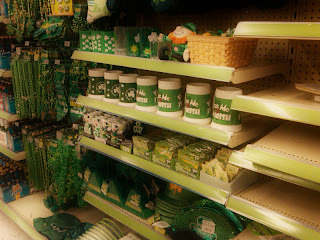 I'm loving that the day after Valentine's Day the St. Patrick's Day items were on the shelf at this Walgreens. Chicago unabashedly loves to celebrate the Day of the Irish! 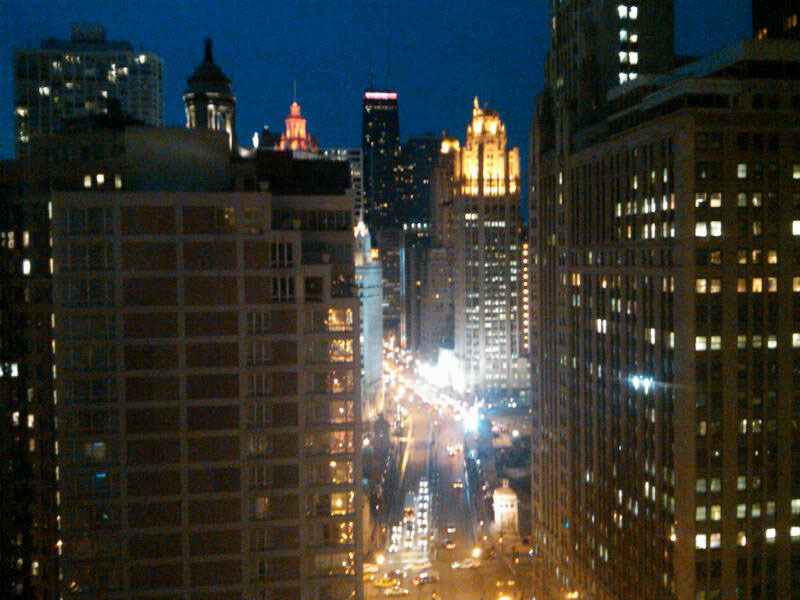 I'm loving the view at night from my hotel room in Chicago. I'm loving the fact that I get to visit the big city every once in a while and then mosey home to my quiet existence in smalltown USA. It's truly the best of both worlds! Now if only the McDonald's at home would offer Coke Zero...then it would be a perfect world! I've never marked my calendar with a big red heart around February 14th but I do like giving my loved ones a nice Valentine's Day card. Unfortunately I am NOT the best at getting cards in the mail on time ever. This year was no exception. I found the cutest Valentines (I thought they were the cutest...really the packaging was better than the cards themselves) months ago, bought them and thought to myself..."This year will be different." Fast forward to Sunday, February 13th, and lo and behold the cards were still sitting in their pretty package on my kitchen table! So, I thought I'd share them on here. Happy Valentine's Day to all of my pals in the blogosphere! I feel the need to explain WHY I decided Pirate Valentine's were the way to go this year. JOKE: Why did the pirate become a lawyer? ANSWER: He liked to ARRRRRR-gue! Are you laughing out loud yet? No, check out my post explaining the joke a bit more. I was planning to give one of these to my coworker who introduced me to the pirate joke but I forgot (again where my organizational skills need work) that she's out this week so I'll leave one on her desk with one of these as a treat for when she returns! Who wouldn't want a pirate Valentine's Day card and a CRUNCH chocolate heart? Exactly four months ago (yes, on 10-10-10) my first gorgeous niece was born. I already had four - yes FOUR - nephews so I was ready to spoil a wee lass after years of tractors, trucks and super heroes. Today (on 2-10-11) my second precious niece was born (to a different sister, of course). Isn't she gorgeous? 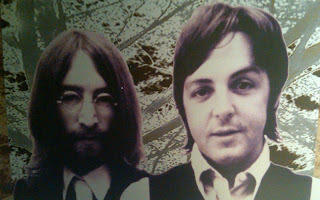 And that head of hair...out of this world. Her mama had a full head of jet black hair when she was born, so I can't wait to compare this little girl to her mama's baby photos. I couldn't help taking a BUNCH of photos. Eventually the flash made her open her eyes! Even more gorgeous! Being the big sister that I am, I couldn't resist snapping this photo of Lil' Sister's feet. Isn't her pedicure lovely? Can't wait to start spoiling this little girl rotten? She's going to look SOOOO cute in that butterfly outfit!